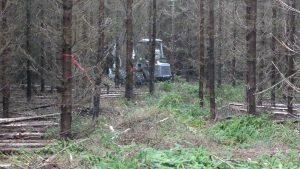 Forestry.com went to the woods to see a Vimek small machine team in thinning. 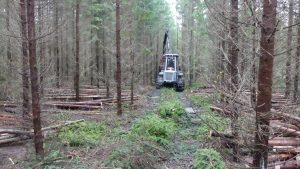 We met forest contractor Wiströms Gallringsuppdrag earlier this winter to see what the process is like when thinning with and stand operated harvester. Read more about early thinning with small machines and see the video and photos here below. In the Nordic countries, most forests are thinned during the rotation period. Thinning is typically performed on coniferous forests 2-3 times whereof the first is done early, at 25 years of age. Almost all thinning are done using machines and there are several methods for mechanized thinning today. Primarily it’s about how you work with the strip roads throughout the thinning stands. Strip road thinning and stand operated thinning are the two main types. Swedish manufacturer Vimek offers small CTL harvesters and forwarders for stand operated thinning. Wiströms has operated Vimek harvesters since 2007. When I visited it was the son, Kenny Wiström, who was the operator. 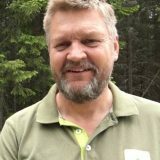 The father, Christer, and his son are both part owners of the company and other than two Vimek harvesters they also have a Rottne H11 harvester and a Komatsu 840 forwarder. Most of the hauling after the Vimek harvester is done by their colleague Per Bertilsson using a Vimek 610. Per both owns and operates the machine by himself. Wiströms and Bertilsson cooperate as a thinning team and serve some of the wood purchasers in the region. Sometimes the hauling is done by the forest owners themselves. The team of Wiström and Bertilsson cut somewhere between 8-10 000 cubic meters per year. Kenny explains that the wood purchaser pays “some dollars” more per cubic meter in order to do the thinning using smaller, stand operated machines. It’s primarily the hauling that costs more. Regarding harvesters, the difference in performance is minor between a small and a larger machine if you stick to first thinning in small diameter stands. 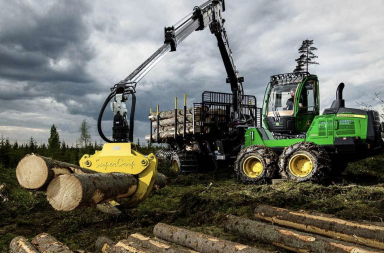 The Vimek forwarder, on the other hand, can’t carry more than half of a load compared with a regular, 10 ton thinning forwarder, so even if the Vimek is smaller, cheaper and more fuel efficient the cost per cubic meter is higher. If the driving distance increases, so does the difference in cost. Still, it appears that many forest owners are willing to pay more per cubic meter in order to get the work done by smaller machines producing narrower roads. 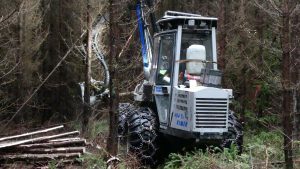 Wiströms is constantly busy and according to Kenny the machine “sells itself” among the forest owners. The buyers receive more thinning projects when neighbors see how nice things look after stand operated thinning with small machines. When I visited this thinning project at the end of November the soil was wet and soft. 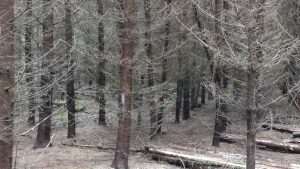 The forest being thinned out grew at old agricultural land with a thick layer of dirt. There was no ground frost but a lot of water all the way up to the surface after a few weeks of heavy rain. The forwarded drove using tracks and the harvester had done a pretty good job at providing a bedding of slash in the strip roads to make the forwarder float upon. The front wheels had dipped at a few places but overall the carriage floated on top of the bedding without visible damage to the ground. Even the main road out to the landing kept intact surprisingly well. The thinning area that I filmed was very densely populated with trees and unfortunately also had a very high damage percentage from deer. Trunk damage as a result of eating bark. This particular forest owner apparently focused more on high game population than on producing quality in the forest… Oddly there was very little root rot despite almost 100% of the trees having trunk damage from deer at breast height. The stand was around 25 years old. I guess that it had around 3000 stems/ha before thinning. I estimate that 30% of the standing volume was removed and the average stem volume was 0.063 cubic meters according to the harvester computer. I clocked the logging a few times and got between 100-150 stems an hour in production which is around 6-9 cubic meters per hour. It was narrow and dark which you can also see in the video. According to Kenny it’s not an advantage when the trees are too densely populated as it takes longer time per cubic meter compared to more reasonable stand density. 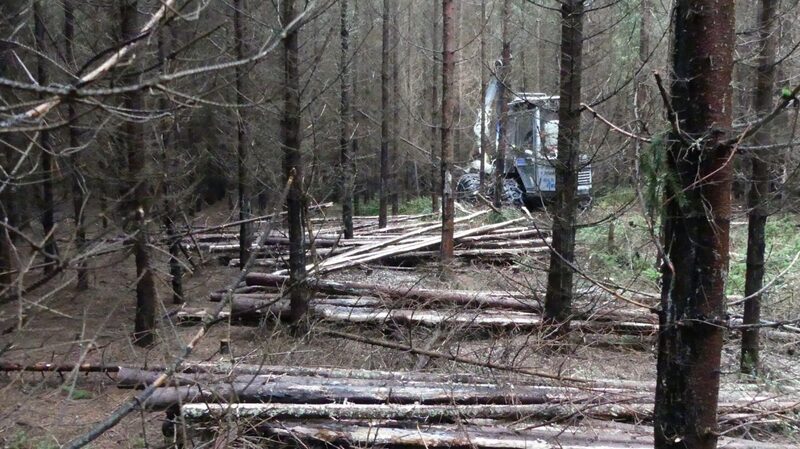 When performing stand operated thinning you use machines, particularly harvesters, that are narrow enough to make their way through the forest without the need to cut down additional trees for its “trail”. You often cut, as in this case, a strip road of around three meters in width if the wood is to be carried out by a smaller forwarder (like the Vimek 610), or with a farm tractor and trailer. If the hauling will be done with a conventional forwarder (like a Rottne F10, Gremo 1050F or John Deere 810/1010), the roads are wider, minimum four meters. And if the wood is removed using one of the smallest mini forwarders (like the Bison, Alstor, etc) or an ATV, a two-meter strip road will do, and that makes both the harvesting and the forwarding fully “strip road free”. The forwarder first cuts open the strip road and thins as far as the crane can reach on both sides of the road. With the Vimek harvester, small inserts are sometimes made to reach slightly further than what the relatively short Mowi-crane (4.6 meters) can otherwise handle. When the strip road is complete the harvester winds its way into the forest and creates a secondary road (even called “ghost trail”) parallel to the strip road, around 7-8 meters from the edge of the road. When this has been done the harvester thins both sides of the road but puts the logs in the direction of the strip road. In this way the forwarder can reach the wood. When the next strip road has been made parallel to the first, around 20-25 meters apart, another secondary road is made in the area in between. The area will be completely and evenly thinned all the way between the strip roads. The Vimek 404 harvester is a narrow machine with only two meters width. Double steering makes it very versatile when its operating in the stand. The Vimek harvester has a unique steering system. Or more accurately, double steering. 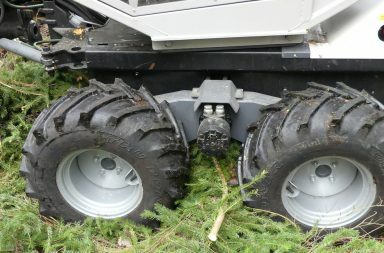 It is operated at the waist using frame steering just as a regular forest machine, but also has wheel steering at the front wheels. This allows it to turn very narrowly and smoothly and ensures that it doesn’t require more space than the actual width of the machine in order to move forward. Wiström’s Vimek harvester is equipped with 500-wheel and according to the Vimek website that means its 2.05 meters wide. Kenny said that the next machine will have 400-wheels as there are always a few annoying centimeters that make a difference when trying to get by without having to remove any main stems unnecessarily. The Vimek 610 forwarder at one of the strip roads. The bedding of slash saves the soil and ground from damage. Just as with everything when it comes to thinning work, the result is highly dependent on the operators’ ability and attitude. You’ll sometimes hear that a stand operated method results in more stem and root damage than strip road cutting, as the harvester moves in more places in the stand. That could also be the result if the driver doesn’t properly apply the bedding with slash. 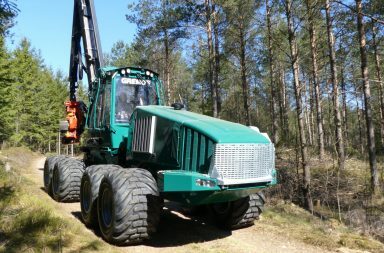 In all fairness it can also be said that quite a bit is required from the operator of a strip road operated harvester to maneuver the tip of an 11-meter crane among the trees without causing stem damage. The Vimek harvester operates considerably closer to the machine itself, with its short crane. I walked along several of the ghost trails to look for trunk and root damage but was unable to find more than a few minor scratches from the chains on the wheels. There was a lot of slash and Kenny laid out a good and protective bedding in the strip roads. You could see how he consistently had placed the bedding against the necks of the roots to protect the trees. There was not a single place where you could tell that the harvester had gone through the bedding and harmed the ground. In fact, afterwards it can even be hard to see where the ghost trails had been. Kenny said that he’s very comfortable in the machine and that he doesn’t mind the small cabin. Since he’s constantly faced the same way as the machine, he doesn’t experience problems with the relatively narrow space. -It can probably be worse in the forwarder, where you constantly turn around to drive in different directions, Kenny says. He feels that he has a good view around the machine and that he has an overview over where the wheels and the closest trees are. He would have wished for a better view upwards, however. Preferably with an arched window, something he has passed on to Vimek as a suggestion for improvement. The most common in today’s thinning projects in the Nordic countries is the strip road method with a conventional harvester, so I’ll describe that too here for those who are wondering how it works. The cutting is typically performed with a harvester such as the Rottne H11, Gremo 1050H, Komatsu 901, John Deere 1070, etc. These are 6-8 wheel machines with crane spans of around 10-11 meters, and weights of around 14 upwards to 17-18 ton. These machines cut strip roads that are four to five meters wide and around 20-22 meters apart, from the road centers. The harvester cuts in between the roads using the long crane and it’s common that these machines have harvesting heads that can handle multiple trees for increased production efficiency. 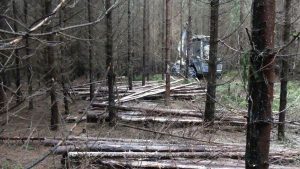 This means that they can cut down multiple trees that are accumulated in the harvesting head before being processed, which saves time. The wood is then hauled using a purpose-built forwarder of a “thinning” size, meaning forwarders that can carry 10 ton or slightly more. Traditional forwarders (for a first thinning) today are Rottne F10, John Deere 810/1010, Gremo 1050F, and some other brands. For stand operated thinning using smaller harvesters, the machines are much lighter and have a shorter crane. Rather than remaining in the strip road while cutting, one or two “ghost trails” are used depending on preference and which type of machine is being used. The harvesters that today are most widely used are the smaller Vimek 404, Malwa 560 and Terri 34C (around 5 tons in weight), as well as the somewhat larger Rotte H8 and Sampo HR46 (around 8-10 tons). 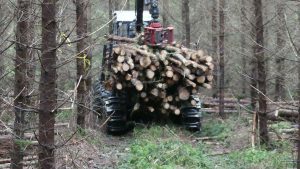 Here is another article at forestry.com where you can see a Rottne H8 harvester and a Malwa 560F forwarder teaming up as a nice thinning crew. 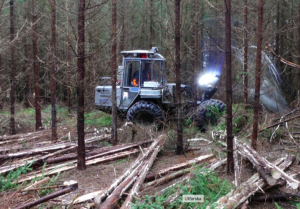 Further north, some thinning projects are performed using stand operated machinery on poor pine stands using conventional harvesters such as EcoLog 550/560.